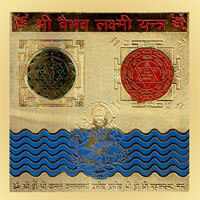 “As the name suggests sarva Manokamna prapti yantra in the yantra which accomplishes one's all desires. The auspiciousness of the yantra at home/shop/work place increases the auspiicousness of that place where it is established and decreases the negative energies of that area. 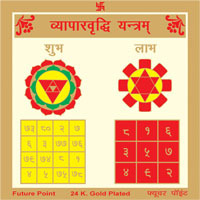 This yantra has numerical grid and the magical effects of the numbers used in the grid opens the new avenues for wealth, success, prosperity and happiness. 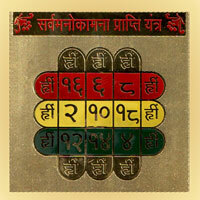 “In Hindu religion, worshipping various yantras for various purposed has been a sacred precept. Sarva Manokamna Prapti yantra is one of them. 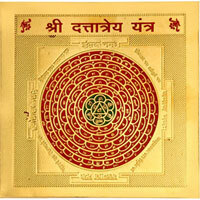 This yantra is the most powerful because it observes all auspicous powers into it. If the worshipper establishes this yantra in Ishan kona and worship it daily, all his desires and ambitious are accomplished and removes all the hurdles in that retard the growth of destiny.